Editor/Author Smith, Susan J., Pain, Rachel and Marston, Sallie A., et.al. The social relations of difference -- from race and class to gender and inequality -- is at the heart of the concept of social geography and this Handbook reconsiders and redirects research in the discipline while examining the changing ideas of individuals and their relationship with structures of power. 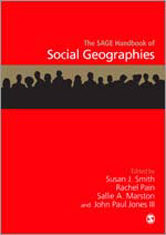 The SAGE Handbook of Social Geographies is for academics, researchers, practitioners, and postgraduates in geography, sociology and cultural studies.